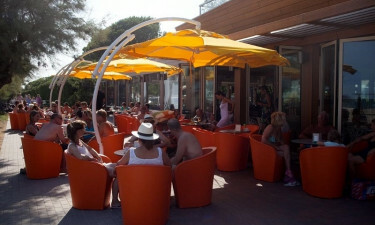 Garden Paradiso Campsite is a luxury camping site that can be found on the picturesque Adriatic Coast of Italy. This part of the country is famous for its warm climate, abundant sunshine and natural beauty. People who rent a mobile home here will find plenty of opportunities to soak up the sun and get back to nature, while LUX-camp also provides an excellent range of amenities for guests to make use of during their holiday. What makes Garden Paradiso campsite so special? Lovers of luxury camping will find that Garden Paradiso Campsite makes the perfect place to use as a base while exploring the enchanting city of Venice. This magnificent city is just a short drive away and in next to no time visitors can be wandering along winding streets to admire impressive churches and bridges. Visitors can also hire a bicycle onsite and use it to head into the city, as well as through the surrounding countryside to really get to know this stunning region of Italy. Sun worshippers are sure to want to spend plenty of time on the sand during their camping holiday. Fortunately, Garden Paradiso Campsite is situated right on the edge of an enchanting sandy beach and guests will find plenty of space here to spread out and enjoy some sunshine. The beach is lined with palm trees, while the water that laps the shore is clean and ideal for splashing around in. Adults who simply want to spend time unwinding in their mobile home or on the beach can be sure that children will be well taken care of at Garden Paradiso Campsite. 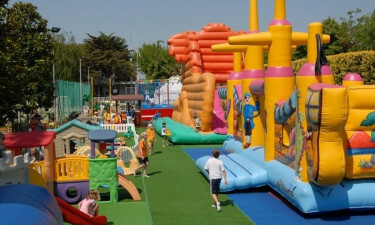 There are three large playgrounds located on the site and young children are sure to love playing on the bouncy caste, while the maxi screen shows cartoons throughout the day and early evening. In addition to splashing around in the swimming pool, children will also enjoy seeing a show at the puppet theatre. Guests who want to indulge in a little retail therapy will want to head on over to the onsite bazaar, where they will find a good selection of shops selling everything from chic bikinis to souvenirs. One of the great things about hiring a mobile home is that they come with cooking facilities, allowing guests to cook delicious meals for their family using fresh Italian products if they so choose.